Younger British citizens who come from Commonwealth countries recognise their immense contribution to British economy, services, sports, hospitality, politics and in general British way of life. Not many people realise that history of people from BAME communities did not start with immigration in early sixties but goes far beyond that into shared history from days of British Raj, including two world wars. A poll conducted by “British Future” has revealed that less than half of the general British public (just 44%) know of the contribution made by Commonwealth forces in World Wars. Great Britain faced with forthcoming BREXIT needs Commwealth more than ever before and events like Commonwealth's shared history in World War 1 and also forthcoming "Commonwealth Games 2022" in Birmingham, is a golden opportunity when this lack of awareness can be & must be urgently addressed. It is a powerful lesson not just for second and third generation Asian & Afro-carribean immigrants, but for our country as a whole. A remarkable template of civic cooperation that emerged almost a century ago between different races and religions, united by common purpose. Their mission was to help Britain resist the reactionary impulse that swept much of Central and Eastern Europe. In that cause, soldiers from the British Indian Army and afro-carribean soldiers helped to give rise to the broadly liberal and progressive culture we enjoy today. This is history that cannot continue to be overlooked. It is an experience that should be given greater and fuller expression, rescued from the condescension of being victorious but voiceless. Lord Lieutenants, Deputy Lieutenants, Peers from House of Lords, MP’s, Senior officers from British Army, Royal Navy and Royal Airforce, Lord Mayors, Mayors, Foreign dignitaries from Commonwealth countries, prominent community leaders, youth from schools, colleges and universities including Cadets are expected to attend this event. Youth performances displaying art and culture from Commonwealth countries along with presentations, displays and exhibitions in addition to walking tour of National Memorial Arboretum has been planned for the day. 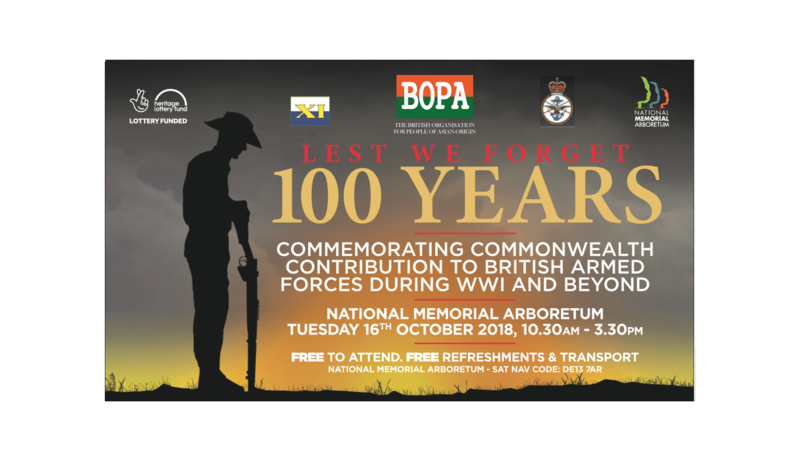 Please support this event to remind and inspire British citizens that come from Commonwealth Countries that we are not merely economic migrants but our forebears sacrificed their lives to create the democracy that we live in today.